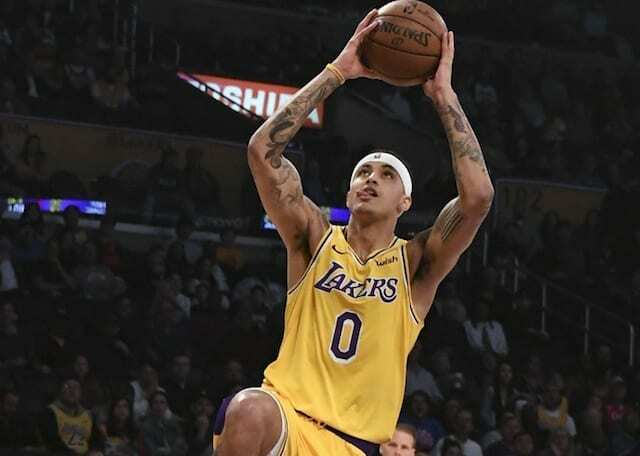 Although the 2018-19 NBA season may not have gone as the Los Angeles Lakers had hoped it would, they can take solace in the fact that Kyle Kuzma looks like the real deal. Kuzma took the league by storm by establishing himself as the biggest steal of the 2017 NBA Draft. He followed it up by proving that his stellar rookie season was no fluke. Kuzma has once again been one of the few bright spots for the Lakers during his sophomore season. However, it seems he is not ready to settle on his merits just yet. “I criticize myself after every game about little things,” Kuzma said. “Every game, I try to think of three things I could’ve done better—and then just blank the game out. I may score 40; I still try to think of something I could’ve done better. Then that game’s over, and I’m on to the next one. Kuzma’s comments are indicative of what has made him one of the more promising, young players in the league. Aside from his vast potential, he is also one of the hardest-working players in the league thanks to his background as an underrated prospect. The 23-year-old managed to follow up his stellar rookie season with an even better sophomore season thanks to a slight increase in usage. He is averaging 18.7 points on 45.6 percent shooting from the field and 30.3 percent from the three-point line. Regardless, Kuzma continues to be adamant about finding little ways to improve his game throughout the season and it has clearly paid off for him and the Lakers. While he may have been tied to a number of trade rumors this season, it may not be long before he gives the front office no choice but to make him part of their long-term plans.